Project Gemini, named after a historic U.S. spaceflight program, leverages the combined strength of HL7 and IHE to implement HL7 FHIR® and advance healthcare interoperability. IHE profiles facilitate the implementation of standards, like FHIR, necessary to achieve interoperability. HL7 FHIR offers an innovative base standard that enables the acquisition and exchange of healthcare data using methods and tools that drive the modern internet. IHE leverages standards across multiple domains to develop implementation guides that define how to achieve interoperability in specific medical use cases. IHE has integrated FHIR into dozens of IHE profiles. In February, five of these profiles were updated to use the newly published FHIR Release 4 (R4), the first normative version of the FHIR standard. These profiles represent a basic API to health data. This set of IHE profiles is consistent with the US-Core subset of FHIR, which is designed to support certification requirements defined by the US Office of the National Coordinator for Health Information Technology. The IHE profiles are, however, intended to be international in scope and do not include US specific constraints. HL7 regularly hosts FHIR Connectathons where different parts of the emerging standard are tested out. IHE Connectathons, which occur annually at various locations around the world, participants engage in a structured, supervised testing process to demonstrate the interoperability and conformance of their systems with IHE profiles. The Project Gemini Steering Committee is identifying opportunities to put the complementary relationship between HL7 and IHE to work. It has identified projects where closer collaboration can help guide and accelerate the adoption of FHIR in use cases where it appropriate. The approved projects including Imaging for Cancer Care and Patient Care Guidelines. The goal of these projects is to foster collaboration between the relevant IHE committees and HL7 work groups, as well as to organize public demonstrations to raise awareness of the work and testing events to help drive implementation. 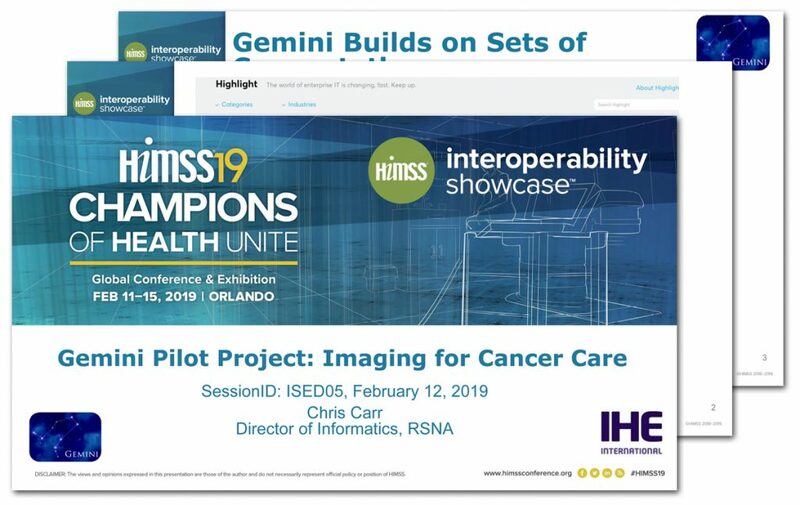 During the IHE North American Connectathon 2019, Wayne Kubick, Chief Technology Officer of HL7, and Chris Carr, RSNA Director of Informatics and IHE International Secretariat, gave a joint presentation on the pilot project. Through this pilot, IHE and HL7 will document clinical use cases, find gaps in the current workflow, and work together to develop and test IHE profiles and FHIR implementation guides. Going forward, IHE remains committed to working with HL7 to realize the full potential of FHIR standards in the healthcare ecosystem.